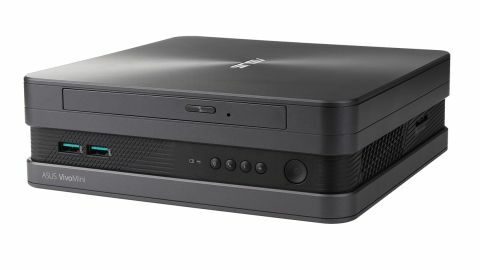 A beautifully made and designed mini PC with tons of power, confusingly promoted by Asus as the perfect means to Skype, of all things. Asus has made mini systems for some time now, and regularly refreshes its line-up when new Intel parts become available. The prior VC65 and VC66 both used Intel 6th-generation (Skylake) processors and chipsets, and now with Kaby Lake silicon available Asus has delivered the VC68V, a new flagship for its VivoMini series. VivoMini machines are designed to be desk-friendly, or even VESA-mounted systems, enabling the user to enjoy the performance of a full desktop system in something distinctly more compact. Depending on which options you go with, the Asus VivoMini VC68V can cost anywhere from £650 upwards, with the VC68V-G030Z as reviewed here retailing for about $799 in the US. These are built to order systems, so pricing reflects what you ask Asus to pre-install and which of the layout options you take. We’d advise that you contact Asus sales for pricing information, as they’ll be able to cost specifically for your order. Pricing on the higher specification Core i7 version has yet to be announced, although it’s likely to be a significant jump over the Core i5 versions, we assume. At least 15 years ago we attended a press briefing Asus gave on the subject of ‘modular design’, something the company was very keen on. Shades of that presentation are evident in the VivoMini VC68V, as this machine breaks down into a series of layers that allows a wide range of potential configurations. The chassis can be configured into three modes: dual storage, dual storage with optical drive and quad drive storage. Our review hardware took the second option, enabling it to have a front opening optical drive and also room for two 2.5-inch SATA hard drives (or SATA SSDs) internally. Extra storage options come in the form of an M.2 PCIe slot. The review hardware had a 256GB SSD module in the M.2 slot that came with Windows 10 Pro pre-installed on it. Optical storage occupies the top layer of this cake, with hard drives in the middle, and the motherboard sits at the bottom. Access to the SODIMM RAM modules is via a hatch below the drive bays, but to get to the M.2 slot requires entirely dismantling the case. Our VC68V had dual 4GB SODIMMs installed (8GB), but you can use 16GB sticks in the two available slots for a maximum of 32GB of system memory. For a relatively small computer the VivoMini VC68V certainly has plenty of power under the hood. On the processor front, there’s a choice of the Core i5 or the Core i7 that came in our review model. They’re both Kaby Lake designs, mounted on a custom Intel Q270 chipset motherboard. It’s also good to see that Asus didn’t skimp on USB ports or video outputs. The VC68V has no less than six USB 3.1 (Type-A) ports, although the lack of any Type-C connectors is somewhat disappointing. Video output is achieved via either a single HDMI or two DisplayPort outputs, a slightly odd scheme of things. However, one positive point from this layout is that if you need more HDMI connectors, adapters that extract those channels from DisplayPort are relatively inexpensive. This is also one of the first systems to offer the possibility of Intel Optane memory, a super-speed memory caching technology that’s meant to boost all computing and drive operations. The review unit didn’t have this technology installed from what we could ascertain, but the machine is made to accept it via the single NVMe M.2 slot. But of all the features, the thing that really made us scratch our head was the buttons along the front fascia that are designed specifically for one app: Skype. They’re really small and so difficult to read, and their inclusion assumes that everyone who buys this computer uses that app. It reminded us of the HTC First, a phone that was made just for Facebook – or even Microsoft’s Kin phones. Asus also went to the lengths of building a special speaker into the case so you can hear international poor sales excuses more clearly from anywhere in the world. If you can ignore these diversions, everything else about the VivoMini VC68V hardware is great for a small system, as long as you don’t need discrete graphics.